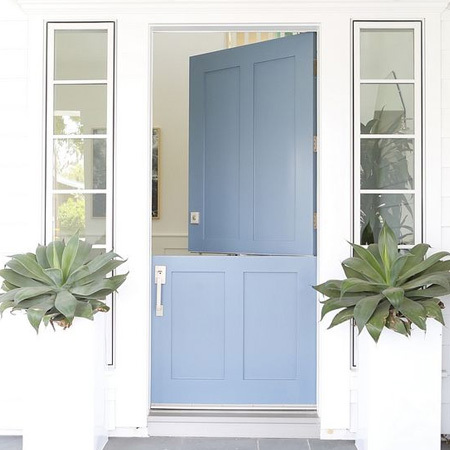 As the first thing guests see when visiting, you want your front entrance - and front door - to be as inviting as possible. Your front door - or walkway up to the entrance - is one of the first things any guest will see when visiting your home. 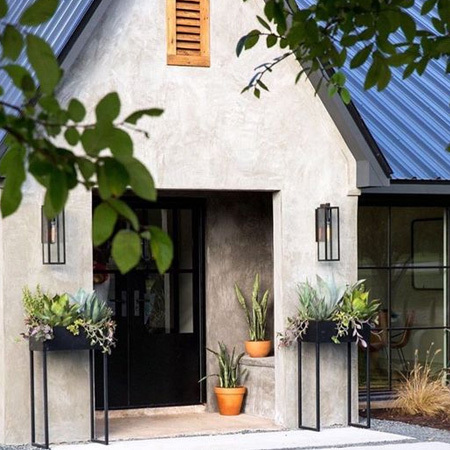 If you want to make a good impression, or perhaps a statement, revamping your front door and adding a few planters filled with colourful or interesting plants will definitely do the trick. 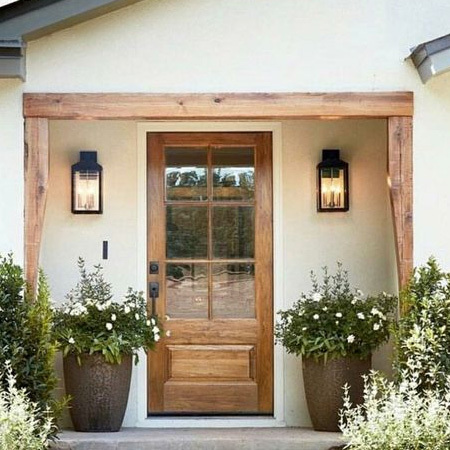 You don't even have to spend a lot of money to give your home entrance more curb appeal, and we've put together a selection of affordable ideas that will really say "hello" to visitors. When compared to other countries, we tend to be a bit boring when it comes to the front door and making a visual impact. It's so easy to paint the front door in a bold colour to make a show-stopping feature that guests can't fail to miss. We generally tend to slap on some wood tinted sealer or varnish and leave it at that. 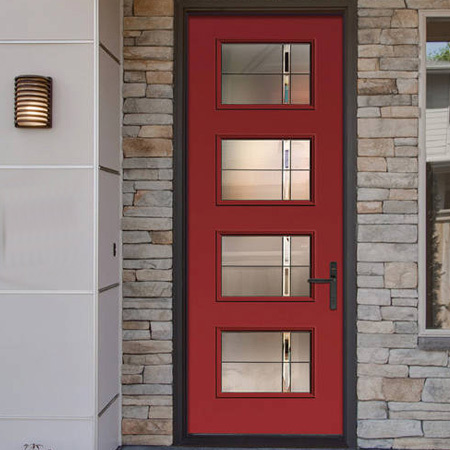 Today's doors come in a variety of modern designs. Choose a style and paint it in a colour that complements the design of your property - it will only take you a weekend to transform it into a beautiful feature for your front entrance. If bold colours are just not your thing, you can always choose a light hue that brings out the best in your home. 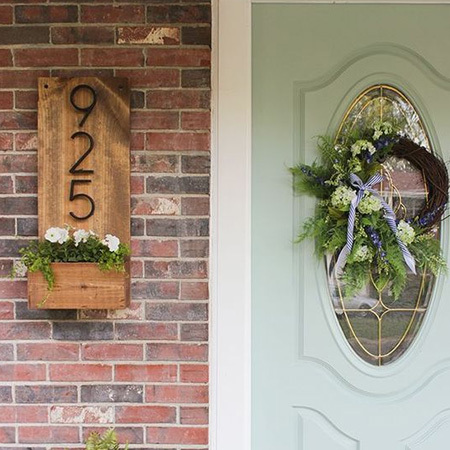 Once the front door is sorted, it's time to add some elements that will introduce a bit of interest. 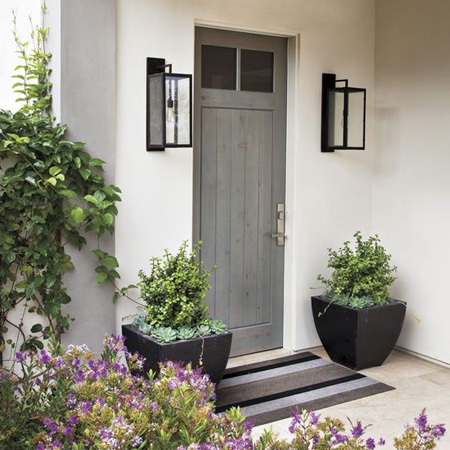 A couple of planters on either side of the door are brilliant at framing the door. You can have a couple of tall planters or a group of smaller planters that create an interesting feature. 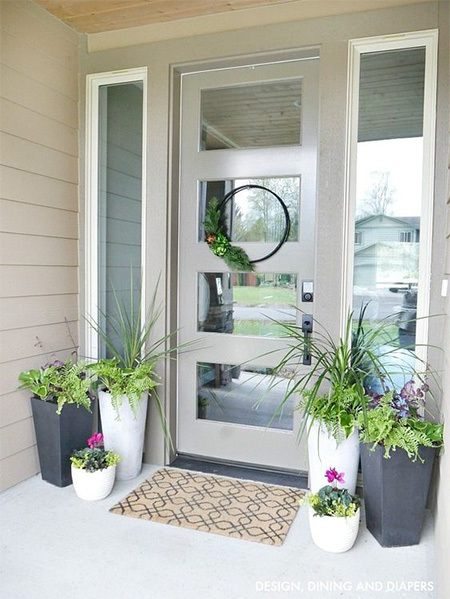 Plants are an easy way to bring texture to a front entrance and frame the door, whether your door is painted a bold colour or stained and sealed. You will obviously choose planters that complement the setting and then fill them up with plants suitable for sun or shade, depending on the orientation of the front entrance and whether it receives a lot of sun, a little sun, or no direct sunlight at all. If you don't want to spend too much time fussing over plants, or don't have a green thumb, there are hundreds of plants that only require minimal maintenance to keep them thriving. The right pots will make all the difference even if they're potted up with small shrubs and a few succulents. 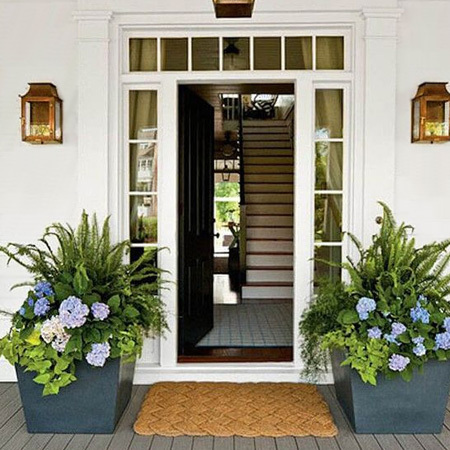 Shop around for planters that make a statement at your front door. If you don't find what you need it's easy to make a couple of planters yourself using reclaimed wood or steel (if you know a handy welder). 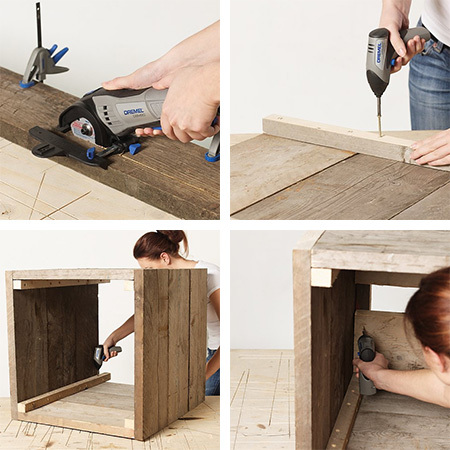 You can source reclaimed pallets at very low cost, and sometimes even free, and these are ideal for making your own plant containers. Simply cut the timber down to size, assemble the basic frame and then finish off with wood stain and sealer. Make a statement at your front door with colourful containers planted up with annual, perennials or small shrubs. 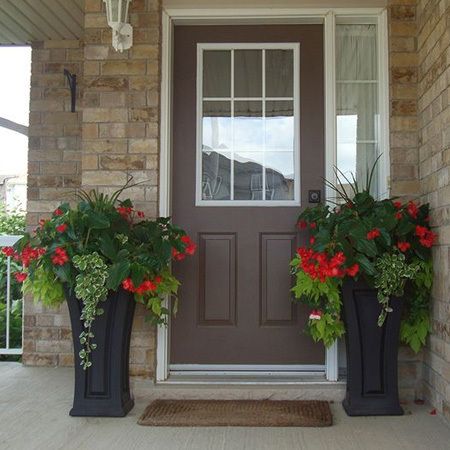 It's so easy to add curb appeal to a front entrance with colourful planters. 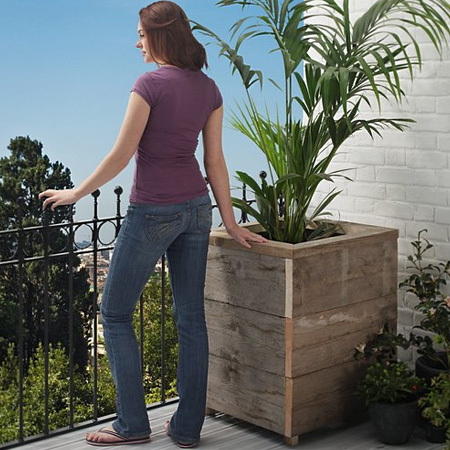 Choose a planter size that fits nicely in the available space. 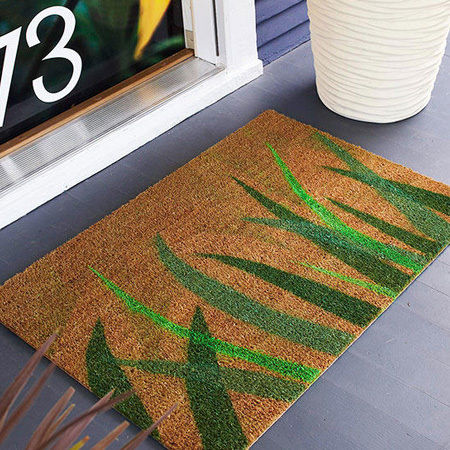 Door mats are a nice addition to your front entrance. Not only do they welcome guests, they also help to keep your floors in good condition by catching a lot of dust that normally gets walked into your home - and a great idea if you have laminate floors. You can buy a plain grass mat and add your own wording easily with spray paint or acrylic paint, or use paint to free-hand your own wording onto the mat. 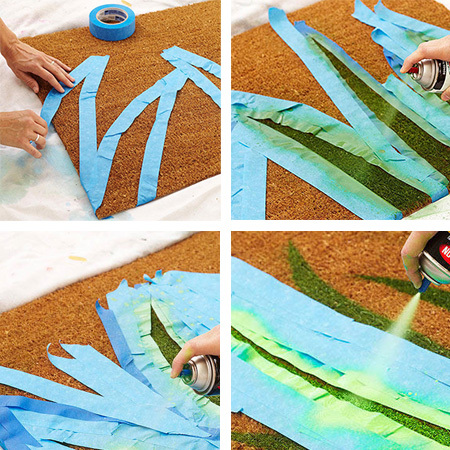 To make your own custom door mat, mask off the design with painter's tape and apply light coats of spray paint in different colours. 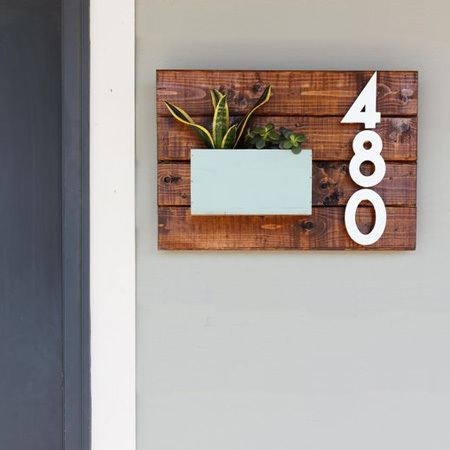 Rather than just mounting traditional house numbers onto a wall, add something unique to the entrance to your home to make it stand out and appealing. Something as simple as a board to display your house number is easy to make, and you can make it using reclaimed pallet wood. 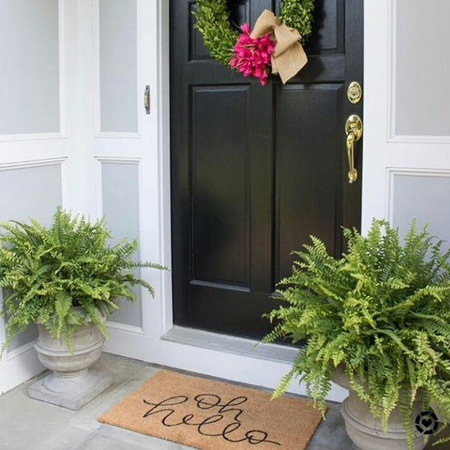 A few personal touches make all the difference when it comes to adding curb appeal and making your entrance welcoming. As with your home interior, personal touches add personality and say a little bit about who you are.